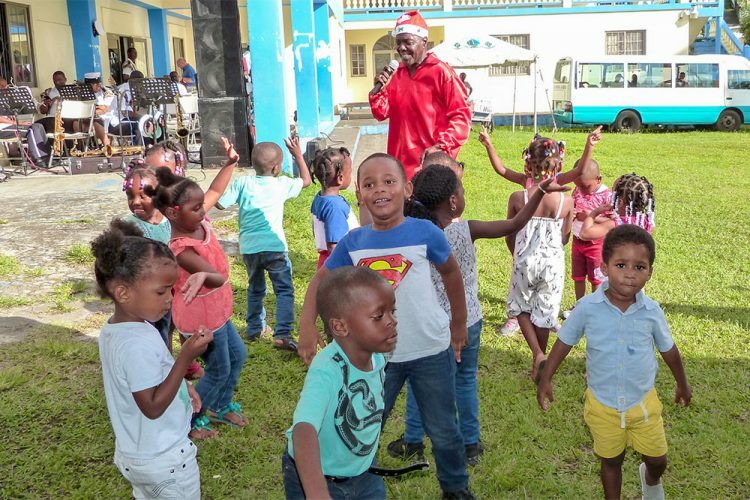 Last Saturday, over 60 children from several pre-schools on St Vincent were treated to Vincentian Chocolate, snacks, singing, music and Santa Claus bearing gifts. The day of good cheer and yuletide spirit came at the Guides Hut at Level Garden during the annual Christmas party organized by the Rotary Club of St Vincent, under the auspices of Governor General Sir Frederick Ballantyne, in collaboration with the Children’s Welfare Fund. The children were entertained in song by Kenneth “Vibrating Scakes” Alleyne who had them singing Christmas songs and prancing around the Guides Hut lawn. After the singing and the snacks, the youngsters lined up for a chance to sit on Santa’s lap. All of them left with gifts. Also commenting, Merlene Edwards-McDowall of the Red Cross Pre-School said that every year, the students are invited to the event and they enjoy it. She said that she brought five children and they all had fun. Cristal John, representing one of the sponsors, The SVG Cocoa Company, said that Saturday was the first time they were sponsoring the event. “We look forward to these initiatives as it is important that every child gets a smile on their face especially during the holiday season. We are happy to be part of that,” said John. She noted that they gave a monetary donation and arranged to have chocolate bars given to each child. “…and the children loved it. Every year we look for something that is worthwhile so that people know the company is here and makes a positive impact and we are not only creating jobs but supporting worthwhile events,” John told SEARCHLIGHT. Commenting, the Governor General thanked the Police Band for providing music while he also thanked the Rotarians for collaborating with the Children’s Welfare Fund. 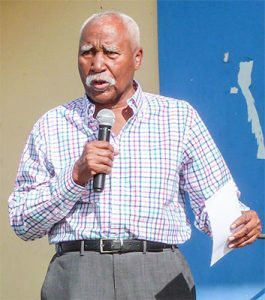 “This is one of the functions that gives me the greatest pleasure,” said Sir Frederick while he also thanked the teachers for bringing out the children who they help to nurture on a daily basis. “I will like to thank the teachers for taking care of the children as what they become depends on you. This is a magnificent day,” commented the GG. Joe Sheridan, Past President of the Rotary Club said he was glad to see children happy. He said that the event is over 25 years old and they will keep it going as long as possible.